At some time during the Napoleonic War the Barracks ceased to be used for cavalry and became a militia depot. The history of the Militia in England begins in Anglo-Saxon times, when every male between the ages of 16 and 60 was liable to appear armed when called upon to suppress internal disorders or to defend the country against invasion. Such a force continued to be the main part of the country's army under various names such as Fyrd, Musters, or Train-Bands until the time of the Stuarts when the word Militia came into more general use. At the Restoration of Charles II it was enacted that the control of the Militia was a royal prerogative, but at the same time the Militia of each county was placed under the Lieutenant of the County. It was controlled and regulated in the county, it was officered by the local landowners and their relatives, and every precaution was taken to prevent its being used by the King for unconstitutional purposes. After going through a period of unpopularity and decline the Militia was re-established in 1756 at the beginning of the Seven Years' War, and Surrey was to have two battalions, the first with headquarters at Richmond and the second with headquarters at Guildford. 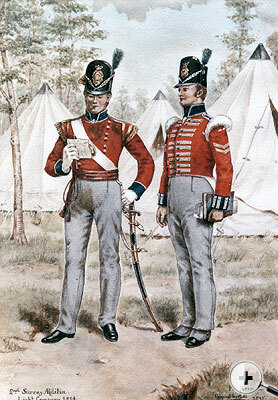 2nd Surrey Militia, Light Company 1814. The story of the wanderings and adventures of the Second Surrey Militia is an interesting one but can only be dealt with here in relation to the barracks. Up to 1812 there was no central headquarters, the Officers' Mess being at the White Hart Hotel (now Sainsbury's) and the rest, when in Guildford, were quartered in public houses, inns and private houses in Guildford, Stoke, Shalford, St Catherine's Hill and the Bowling Green. There are records of their being marched to these areas from places such as Richmond in 1760, Winchester in 1799, and Hersham in 1803. In 1812 a new Act increased the numbers of Local Militia to be raised, and it is probably at this time that the Cavalry Barracks at the Friary was handed over to the Second Surrey, which had become 'Royal' in 1803, under Colonel George Holme Sumner. From 1812 to 1814, the soldiers most seen in Guildford would be the Militia, with scarlet coats faced with blue, and white leggings. The Battalion, under Colonel Sumner, consisted of one lieutenant-colonel, two majors, ten captains, twelve lieutenants, eight ensigns, one adjutant, one quartermaster, one surgeon, one sergeant-major, forty-six sergeants, twenty-three drummers and about a thousand men. 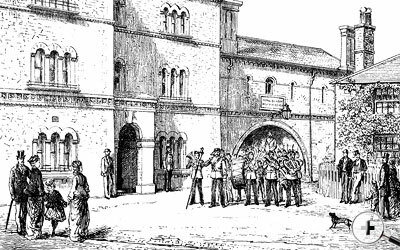 Most of them went to Ireland to fight in the campaign there and in 1813 there were at the Guildford Barracks recruiting parties consisting of a captain, one or two sergeants, a drummer and four or five rank and file. At this time all men were recruited 'by beat of drum'; there were four such parties at various times in Guildford in that year, which was enjoyable for those inhabitants who liked drums. In 1814, Napoleon having apparently been finally defeated after his disastrous retreat from Moscow, the Militia were disembodied and on June 24th on the Barrack ground in the old Friary garden the Second Royal Surrey Militia were disbanded, their ammunition and arms having been stored in Ordnance depots at Chelmsford and the Tower of London. No one expected another war, and they were only called out four times for training between 1814 and 1852. In 1813 Mr F Schobert, in his 'Beauties of England and Wales', remarked that 'the barracks are about to be rebuilt in a handsome and substantial manner', but this never was done, and in 1818 almost all the buildings were demolished. Among the names of officers of the General Militia, the Local Militia, the Volunteers, the Fencibles, 'the Yeomanry, the Supplementary Militia and the Provisional Battalions raised during the French Revolutionary period (causing deep confusion to the historian) appear regularly Onslow, Molineux, Weston, Sumner, Midleton and Austen, all members of the landed gentry whose estates encircled the Borough of Guildford.